Photo courtesy Yvette Doucette, PEI Newcomers Association. 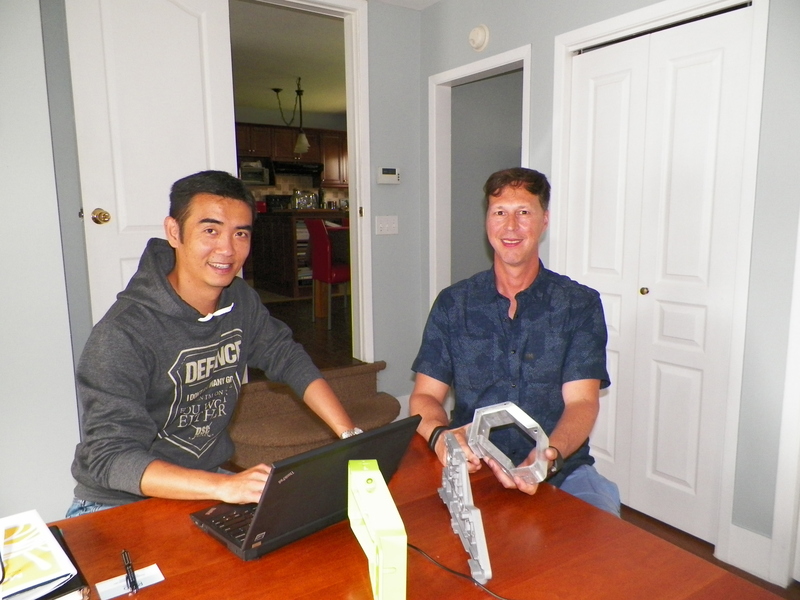 When Shanying Wang was looking for someone to be director of sales for Reito Industrial Products, the company that he established when he moved to Prince Edward Island from China, he had to look no further than his Enhanced Employability Essential Language Skills (EEELS) classmates to find the perfect candidate. Torsten Kutterer, who moved to the Island with his wife, Anja Nied-Kutterer, from Germany, had the expertise and skills that Shan Ying was looking for. At first glance, it seems like an unusual pairing – the tall German gentleman and the slight Chinese businessman – but it’s working very well for both of them. Shanying’s company, Reito Industrial Products, uses several Chinese manufacturing partners to create precision castings in metals and plastics. Primarily focused on the furniture, auto and construction industries, the company can also service other areas. One of the company’s main customers is the prestigious German furniture manufacturer Walter Knoll. Shanying came to P.E.I. under the Provincial Nominee Program with his parents, his wife, and their teenaged daughter. The couple had a pleasant surprise just after they moved here, when they discovered that they were expecting a new baby. Shanying holds a bachelor degree in Polymer Science; and as a factory owner in China, he has extensive experience working with an international clientele. Given that he already has some heavy-hitting clients in German, Shanying wanted to find a business development person who would be able to represent the company competently in that country. Enter Torsten. Torsten came to the Island as a skilled immigrant. He said he and his wife Anja were looking for a change in their lives, and were planning to go to British Columbia when they left Germany. But a few weeks before their departure date, a chance meeting with friend of a friend made them rethink their decision. “We were hosting a wine tasting party, and one of the guest brought along a friend, who was from Souris, P.E.I. When he heard we were planning to come to Canada, he convinced us to consider P.E.I. instead,” he explained. After thoughtful consideration, the couple decided to come here. Anja enrolled in Holland College’s Pastry Arts program at The Culinary Institute of Canada, where she excelled. By the time she graduated, she had obtained employment with a local coffee house. Torsten, in the meantime, was attending language training at Holland College. The men became friends in the classroom, and are now working together. They said the business classes that Holland College offers to students in its language training program were immensely helpful. Torsten emphasized that language training is crucial to assimilating to one’s new home. Shanying agreed, adding that while the ability to communicate is vital, there are other ways newcomers can find their niche in this province. “Maybe you can’t communicate, but you can show the skills you have. I play soccer and pool, so that has helped me make new friends,” he said. Torsten, who plays soccer and tennis, agrees. 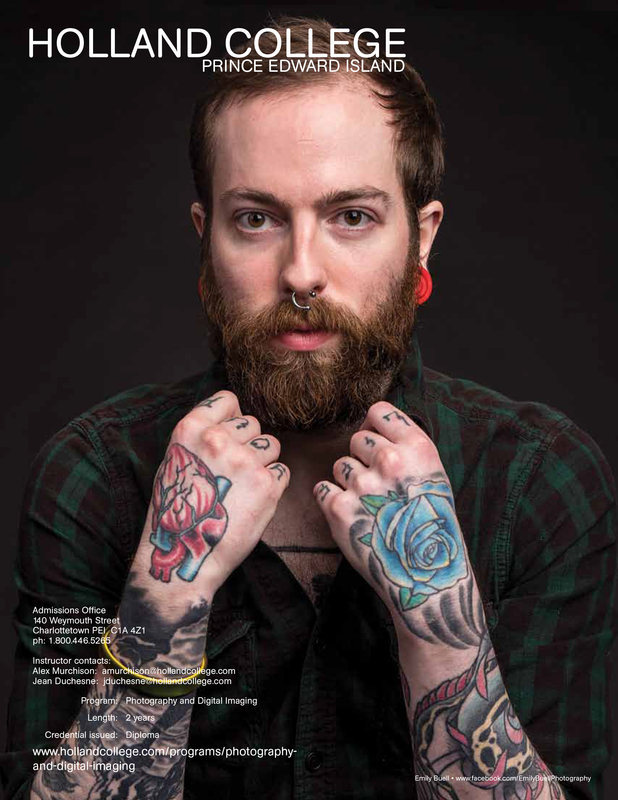 Kudos to Photography and Digital Imaging alumna Emily Buell for having her pic chosen to represent Holland College in PhotoEd Magazine’s school issue!